I finally got to play with some new items from the Occasions Mini~ Here is the Pompom Trim in Melon Mambo that I just had to have. I put the trim on with Tombow Adhesive and I have an awning of (retired) Going Gray above it so it looks a bit more finished. But the edge is pretty and could be left out in the open, as well. Also, I used the banner from the Petal Cone Bigz XL die. Isn't it sweet? I used a marker to isolate the words in the sentiment from Filled with Love so that it is one line instead of stacked. I slipped a (retired) piece of Clear Tinsel into the button holes and tied it in a bow--SPARKLES! But the place I started on this card is the piece of water color paper that is imprinted using my Lots of Love Letterpress plate. The texture on the paper really grabs the image and imprints it beautifully. I decided to leave it white-on-white for simplicity and I tore it into shape for the card. I love to read your comments, so leave one, if you please. 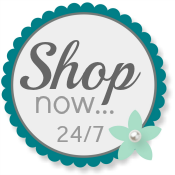 Please email me if you have any questions, and don't forget you can order Stampin' Up! 24/7 from my website. OOOO Patti I LOVE Melon Mambo, this is beautiful....those pom poms are SWEET!!! Fabulous Valentine!! Wow! I love that banner with the button! The sparkly tinsel really sets off the entire card! Beautiful color combination! Love the touch of tinsel. Oh Patti, I was just wishing I had those fun pompoms for my card today!! Very pretty Valentine!! Neat idea with the letter press. Love the pompoms too! Left you something on my blog today. LOVE those pom poms! Super cute card!